The USA today made it emphatically clear that it would not declare Pakistan a terrorist state as it had been a very “stalwart ally” in the USA’s fight against terrorism. “As far as putting Pakistan on the terrorism list, just to point out again, Pakistan has been a very stalwart ally in the fight against terrorism,” US State Department spokesman Richard Boucher told reporters here. For many long years, the Kashmir issue has baffled the international community and defied a credible solution that will be acceptable to India, Pakistan and the people of Jammu and Kashmir. For President Pervez Musharraf there seems to be no limit to the powers he can usurp for himself. Right now he is the army chief, head of state and the single most important person ordering his kind of constitution for the beleaguered state of Pakistan. Anwar Keneth, a Pakistani Christian who has claimed himself to be Jesus Christ, is escorted to jail by the police in Lahore on Thursday. A former government official, who had called Islam a fake religion, he was convicted of blasphemy and sentenced to death. Thirty Indians held under conditions akin to slavery in Tulsa in Okhlahoma have been freed, a report said today. Two suicide bombers blew themselves up in south Tel Aviv, killing three bystanders and injuring 40 in the second attack in two days, the police said. 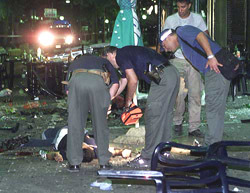 Investigators examine a body lying in the street at the scene of an explosion in Tel Aviv on Wednesday. American warplanes bombed a village in Nangarhar province in eastern Afghanistan today, killing one person and wounding several others, a news report said. Two newspapers here were shut down and their Editors arrested today for publishing obscene articles and photographs, the police said. The USA today made it emphatically clear that it would not declare Pakistan a terrorist state as it had been a very “stalwart ally” in the USA’s fight against terrorism. “As far as putting Pakistan on the terrorism list, just to point out again, Pakistan has been a very stalwart ally in the fight against terrorism,” US State Department spokesman Richard Boucher told reporters here. His comment came close on the heels of Deputy Prime Minister L.K. Advani’s statement in the Lok Sabha on July 16 saying that if the USA had threatened to declare Pakistan a terrorist state, Islamabad would have certainly taken effective steps to dismantle terrorist infrastructure within its territory. Mr Boucher said infiltration across the Line of Control was down ever since Pakistan President Pervez Musharraf pledged to halt it, adding that further steps be taken to stop it permanently. “As we have mentioned before, President Musharraf has assured us that infiltration across the Line of Control will be ended permanently. We continue to look to him to take the steps to make that effective.” Mr Boucher said. ISLAMABAD: The USA has said it will not press Islamabad for the extradition of Britain-born militant Ahmed Omar Saeed Sheikh in connection with the kidnapping and murder of American journalist Daniel Pearl as Sheikh was already facing a death sentence in Pakistan. An anti-terrorism court in Hyderabad passed the verdict on Monday in which it also sentenced three of Sheikh’s associates to life imprisonment. They have seven days to move the high court against the verdict. A US State Department official on Wednesday said, “We are waiting for the outcome of the case. 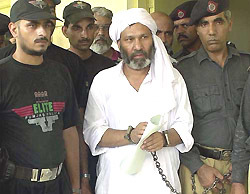 After all he is under a death sentence,’’ the daily Dawn reported on Thursday. On March 14, a federal grand jury in Trenton, New Jersey, had indicted Omar on the charges of kidnapping Daniel, who was working for the Wall Street Journal. NEW YORK: Judea Pearl, father of slain reporter Daniel Pearl, has said the guilty verdicts against four men involved in the murder have proved to the world that Pakistan has the strength to subdue terrorism and secure justice and dignity for its people. For many long years, the Kashmir issue has baffled the international community and defied a credible solution that will be acceptable to India, Pakistan and the people of Jammu and Kashmir. Now, former Indian naval chief Admiral L. Ramdas has come up with a novel plan that he feels could break the logjam that had recently brought the two neighbouring countries to the brink of a war and possibly a nuclear confrontation. At a press briefing at the National Press Club here today, Admiral Ramdas proposed that the people on both sides of the Indo-Pakistan border would be given the choice of whether they wanted to be citizens of India or Pakistan and if they wanted to move from one side to another, be given the opportunity to do so in peace and security. To implement this Admiral Ramdas suggested that both countries should agree to some form of international supervision and this role could, perhaps be performed by a SAARC monitoring team. Under the plan, those displaced from their lands and homes by the current conflict, such as the Kashmiri pundits, could be allowed to return to their homes in peace and security. And finally, the border between India and Pakistan in Kashmir should be kept porous to enable Kashmiris on both sides to cross it for personal, family and business reasons without too many has sales. “In this way we can facilitate the expression of the wishes of the people of Jammu and Kashmir, “Admiral Ramdas said. The Line of Control in Kashmir, with minor modifications could be regularised as the international border between India and Pakistan. In other words, it would be recognised as the de jure result of what had been a de facto partition of Jammu and Kashmir. But on a more serious note, the former naval chief said there was no military solution to the Kashmir issue and it was terribly important that both India and Pakistan entered into a dialogue. He also proposed that both countries should reaffirm pledges to negotiate all outstanding issues between them peacefully and not resort to war, proxy or otherwise. This meant, first of all, a ceasefire along the Line of Control. Pakistan would agree to a policy of no-first use of nuclear weapons, which India had already adopted. This, he noted, was the equivalent of a nuclear ceasefire. Admiral Ramdas, chairperson of the Indian Chapter of the Pakistan India Peoples’ Forum for Peace and Democracy and a member of the National Committee of India’s Coalition for Nuclear Disarmament and Peace, stressed that only sustained peace could lift the clouds of war and the threat of nuclear incineration of South Asia. For President Pervez Musharraf there seems to be no limit to the powers he can usurp for himself. Right now he is the army chief, head of state and the single most important person ordering his kind of constitution for the beleaguered state of Pakistan. From day one, the Supreme Court has been at his beck and call, putting a stamp on all possible amendments, Musharraf could think for the 1973 constitution. The Chief Election Commissioner has most willingly played to his tunes. First was the election of Nazims and then was the infamous referendum. The Commissioner never said no .In fact, besides the army the civil administration has been happy playing the happy second fiddle since October, 1999, when Musharraf seized power. But somewhere this commando turned politician feels insecure. The more he assumes powers, the less powerful he becomes. He then starts dismantling the system in order to create a new more secure one. This game has gone on. Now through the second most important amendment, he is designing a full-fledged constitutional role for himself and for the army. In future, as some commentators suggested coup d’etat would not be called unconstitutional. The proposed decree that no person will be allowed to hold prime ministerial office more than twice is open to criticism on similar grounds. It is obviously no coincidence that Benazir Bhutto and Nawaz Sharif have each served two truncated terms in that capacity. All four stints proved to be disastrous in a variety of ways. In the opinion of many Pakistanis, including General Pervez Musharraf, neither of them deserves another go at the helm. But, surely, such a matter ought to be decided in the court of public opinion rather than at the whim of a military ruler, least of all one who has a vested interest in keeping both of them out of power. In addition to these powers, the President will also have the authority to appoint the provincial Governors, nominate the Prime Minister at the federal level directly and the Chief Ministers at the provincial levels indirectly through the Governors appointed by him. The President already has the power to appoint the senior most judge of the Supreme Court as the Chief Justice. The President in his discretion will make the appointment of the Chief Election Commissioner under Article 215, after soliciting the views of the Prime Minister and Leader of the Opposition in the National Assembly. The appointment of the CEC will be for a single fixed term of five years. The Federal Government has proposed another amendment for the appointment of the Governor State Bank of Pakistan and Members of Central Board of Revenue for a single term of Five Years. The President, in his discretion, will be authorised to remove them after consultation with the Prime Minister. Any member of the parliamentary party can be disqualified and will cease to be a member of his Political Party if he dissociates himself from the party and even votes contrary to any direction of his party. According to the second phase of the amendments, a member of any party will also be disqualified if he abstains from voting in the House against parliamentary party policy. The government also proposed amendments in Article 63A of the constitution and now the Speaker will refer the case of disqualification of any member on the request of the leader of the party and refer it to Election Commission to take a final decision within 30 days. According to the second constitutional amendment package, the government has proposed to make it mandatory for parliament to enact a law for creating a mechanism for enabling the Council to “formulate and regulate policies” and “exercise supervision and control” over the institutions related to the subjects assigned to it. The Indians, without proper visas, were working for a pickle factory on half the minimum wages and were denied adequate food, NBC-TV reported. They were made to sleep in a small room in a warehouse and locked in, with a guard outside, it said. Some of them escaped from the compound and went to a nearby church to tell their tale of woe. The attack took place last night in the old central bus station area in Tel Aviv where many foreign workers live. Most of the injured were foreign workers, the police said. The suicide bombers blew themselves up at a distance of 15-20 metres apart on the busy street. The explosion was horrible and there was blood everywhere, an eyewitness told Israel television. The attack came a day after three Palestinian gunmen ambushed a bus at a Jewish settlement near Nablus killing eight and wounding 15. Mr David Baker, an official in the Prime Minister’s office, placed the blame for the attack squarely on the Palestinian authorities. The Palestinian authorities denounced the attack, but cautioned Israel to share the blame. “We condemn this operation. This will not help the Palestinian people. But Israel bears part of the responsibility because of its continued occupation of our territories and towns,” Mr Ahmed Abdelrahman, Cabinet Secretary, Palestinian Authority, said. Molvi Ahmad was killed when a bomb hit the house of his brother, Noor Mohammad, in Pirakhel village in Khogiani district, about 55 kilometres west of the provincial capital of Jalalabad. Noor Mohammad was the administrator of Dara Noor district of the province under the Taliban regime, but had cooperated with the USA-led operations against the Taliban and Al-Qaida remnants in Tora Bora. He had developed some differences with the USA-backed authorities in Nagarhar. The police raided the offices of the two Urdu-language newspapers, the Morning Special and the Evening Special, and found obscene material. The newspaper offices were sealed and publication was suspended for 30 days.